Unwanted guests are never fun, especially when you can’t ask them to leave. Luckily, Shelton pest control companies have no problem kicking them out. Whether there’s a rodent in your basement or insects in the attic, call your local Shelton exterminator to take care of them — do not try to wrangle them out yourself! Not sure which type of home pest control service in Shelton, WA can tackle your issue? Read profiles and ask about their past experiences to get a good idea. Good News Pest Management, Inc. has successfully been completing projects for residential and commercial consumers for over nineteen years. 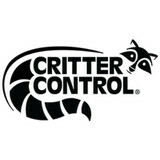 I am locally owned and operated company that specializes in insects and rodents. Your satisfaction is my main priority so, you can count on Good News to be efficient and provide safe treatments in your home or business. Don't wait call today! Welcome! 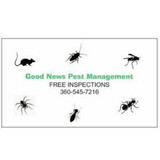 We are your local and family owned pest control company serving all Pacific, Grays Harbor, Mason County Washington and Clatsop County Oregon. We specialize in providing environment friendly barriers against all types of different pests. Our IPM Pest Control Programs create a safe barrier around your home or place of business that prevent all types of pests from crossing and invading. We use only the best EPA approved materials along with earth friendly application methods and practices. We are especially attentive to the safety of children and the elderly. 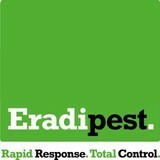 Please call us all today and receive a guaranteed solution to all your pest problems. Thank you! Having been self employed for over 25 years, I have found that nothing is more important than excellent customer service, quality work, honesty, and fair pricing. More than 20 years of proven knowledge and experience in the pest control and crawl space clean-out industries. We are a veteran owned small business, and have been active in our community since beginning in business. Standard Pest Control provides reliable and affordable pest control service. 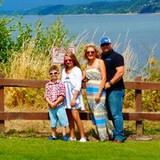 We are a family owned and locally operated business serving Thurston, Mason, Lewis and south Pierce counties. When it comes to pest control services, it’s not enough to just choose a company that will merely get the job done. Our Pest Control Programs are designed to help you keep your family and the environment protected, and every day, more and more families are finding Mathis Exterminating to be the finest solution. When pesky insects and animals invade your property, it can become an obnoxious nuisance for both indoor and outdoor activities. Fortunately, Freeman Pest Control provides excellent pest control service that can get rid of all your pests with affordable efficiency. Freeman Pest Control can take care of everything from insects to rodent removal and anything in between. If you have a wasp or bee infestation, give us a call. Our mission is to help the community by helping one customer at time by treating their pest problems, and treating every house like it is our own. We stay up to date with our licensing and take regular classes to ensure that we treat every home and business with the the right treatment, and to keep our customers safe. We provide pest control and bug inspection services so you can be absolutely sure your home is pest free. If you have some irritating ants nestled outside your home or commercial area, call our ant control service so we can get them out of your hair. We also extend mouse control service for mice and rats. Don’t wait any longer and allow those pesky animals to chew away at your wires or make a home for themselves in the walls of your property. We'll send someone right away to take care of the problem and put your mind at ease. Freeman Pest Control provides both residential and commercial pest control, so if your home or office needs help, we are here for you. We can handle anything from raccoons to hornets. With our experience and reputation, you can trust that you are in good hands. If you are looking for an excellent pest control company, call Freeman Pest Control in Aberdeen, WA today! For his entire life, insects have intrigued Luke Clark; he’s always been fascinated by how they function and adapt, which is why he entered the pest control industry more than 15 years ago, in 2001. Luke is passionate about solving clients’ problems with rats, spiders, termites and other pests, in addition to researching and learning about the most environmentally friendly way to approach pest control. Luke lives in Yelm with his wife and two children. Arbor Pest Control will help you fight back against the pests making your life miserable! Whether your property is commercial or residential, whether your problem is indoors or outdoors, we have the local experience you need! Protect your residential and commercial property with locally experienced and fully insured pest removal services from Arbor Pest Control. 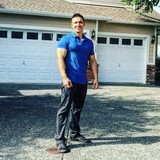 ANTMAN has been protecting homes in Washington for over 20 years, endeavoring to satisfy every customer, and to become hated and feared by their pests. You can have confidence that the Antman, Rick, will do everything he can to solve your pest problem. Rick has been licensed in Washington state for 20 years. He's had experience working for some of the larger companies in the industry, so he has learned what works and he knows what it takes to do a good job! Protecting your family, your home, and the environment is of utmost importance to ANTMAN PEST CONTROL, and we are happy to answer any questions and concerns you may have. Our materials are bio-degradable, low odor products, and it is rarely necessary to vacate during treatment. You can count on Antman to treat your home or business in a courteous, professional manner. We guarantee that you will receive the best treatment possible by a highly skilled and experienced technician, utilizing the most effective materials, methods, and equipment available in the professional pest industry.